Rosie Lee was given another chance. Just days before an old gentleman at a skilled nursing facility passed away, Rosie Lee, a registered therapy dog, lay on his bed, nestled next to him. He reached out and petted her. Her visits had highlighted his time there; he even kept a photo of her in his wallet. A year or so ago, no one would have imagined the dog would be providing comfort to an old man in his last days. She was in an open-admission shelter in Alabama and stood a strong chance of being euthanized. 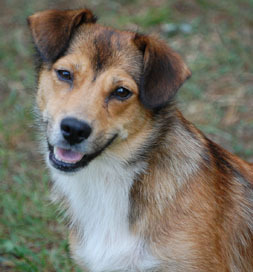 Fortunately she was taken in by Crossing Paths Animal Rescue and given another chance. The Alabama rescue has a “sister” shelter in Pennsylvania, Save A Pet, that listed Rosie on Petfinder in hopes of finding her a home. Devon Conover of Windham, CT, saw Rosie’s listing on the Save a Pet website. She had two Golden Retrievers but wanted to adopt a Corgi mix, and Rosie looked perfect, so she set the wheels in motion, both figuratively – applying to adopt — and literally — Rosie arrived via a transport truck that regularly brings dogs north to homes. 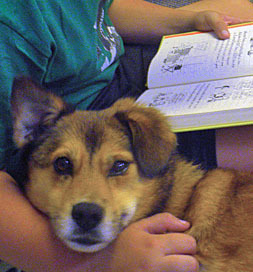 Rosie assists children learning to read. One of Devon’s dogs was a registered therapy dog, and soon Rosie began her training. She is also a Reading Education Assistance Dog [R.E.A.D.] and visits early childhood centers and local libraries where children read to her. Her volunteer work doesn’t end there. During exam week at the University of Connecticut, Rosie hangs out at the University library, helping students de-stress as they study. The Conovers spend their summers on Prince Edward Island, Canada, where Devon and Rosie make their therapy visits. They also started a R.E.A.D. program at the library. “Two of the children were afraid of dogs when we were introduced, but became fast friends with Rosie over the course of our visits and learned some important skills about how to approach dogs gently,” Devon says. Devon and Rosie are quite a team. Their volunteer work makes things “rosie” for many people.